Although the names are sometimes used interchangeably, chinups and pullups are two different exercises for your back. The difference between these two exercises is minimal -- no more than a grip change -- but this simple feature affects the nature and the difficulty of the exercises. 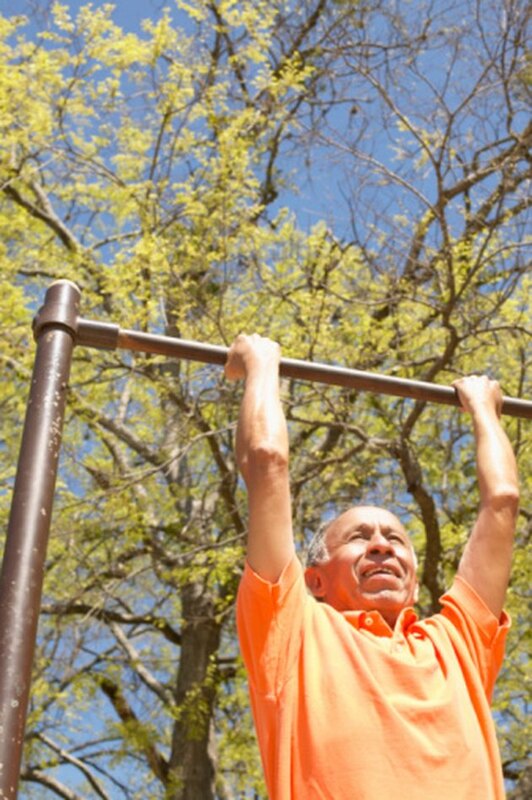 Pullups are harder and emphasize different muscles than chinups. A pullup uses an overhand grip -- your palms face the floor. Grab a pullup bar with a shoulder-width, or slightly wider, overhand grip. You can cross your ankles if that is more comfortable for you. Start with your arms fully extended, but maintain a slight bend in your elbows to reduce the stress on your joints. Squeeze your shoulder blades together and down, and bend your elbows to pull yourself up until your chin reaches or passes the bar. The general form for a chinup is the same as for the pullup, but you use an underhand, shoulder-width grip, with your palms facing the ceiling. Start with your arms extended, but a slight bend in your elbows. Squeeze your shoulder blades together and down, and bend your elbows to pull yourself up to the bar. Because your palms are facing up, the chinup is mostly a shoulder extension movement -- you move your upper arms down and to the rear. The pullup is a shoulder adduction movement. You move your upper arm down to your sides. Chinups and pullups target your back muscles, specifically the latissimus dorsi, which is the large muscle that runs down your back on each side of your spine. Both exercises also work your biceps muscles. The underhand grip of the chinup pulls your biceps into the exercise more than a pullup. During a chinup, you are actually doing part of a bicep curl. This is the main difference between a pullup and chinup -- the chinup activates the bicep muscles more than a pullup. Chinups and pullups are challenging back exercises. You have to pull all of your body weight up to the bar. Pullups are more difficult for most lifters because you don't get the assistance from your biceps like you do in a chinup. If you can't do a full pullup, start with chinups. If you can't do a full chinup, start with lat pulldowns and gradually increase your weight until you can pull your own body weight.